Metrics are dead! Long live… metrics? Last week, we unveiled MyScienceOpen, our new professional networking platform for researchers. MySciencOpen comes with a whole cadre of new features that combine the functionality of a range of existing social platforms, and bring them directly to you all in one place. You get access to all of this at the click of a button through our ORCID integration. Free, legal, and easy! One of the main new features we’ve added is the ability for authors to upload non-specialist summaries to their articles. This is great for increasing the visibility and impact of your research at the point of discovery. But how can you track this increased impact? Aha, well, we thought of that. 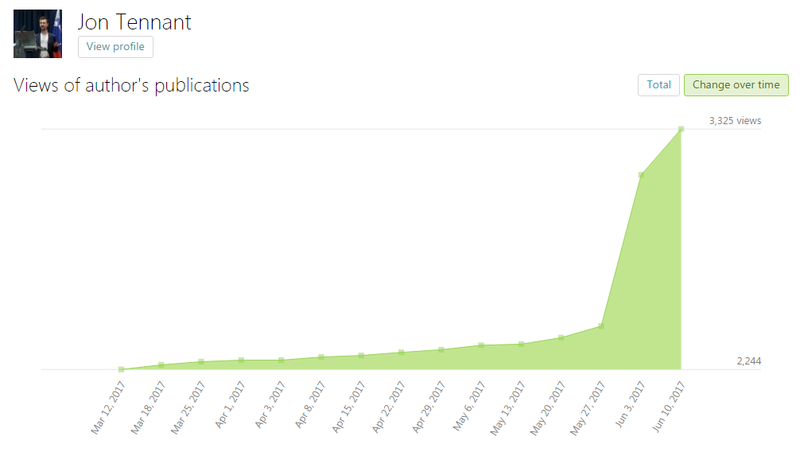 Every user at ScienceOpen now has a whole suite of brand new metrics that track how their content is being re-used across ScienceOpen. Each of these are private to individual users, at the moment. You can display them either as running totals, or track the changes through time. No other platforms gives you all of this for free for your entire, integrated publication record. Total readership stats through time (source). That spike is what you get after you add non-specialist summaries to your articles! For citations, these reflect only those which are drawn from our current database of 32 million records. As such, they won’t be as complete as Web of Science or Scopus (yet), but we’re giving them to you for free! If you want to see a more accurate picture of citations, get your colleagues who you know have cited you to integrate their publication records through ORCID. Every time a user updates their profile with ORCID, our database gets more complete so that we can provide more accurate citation metrics for you. The next step for these features is to ask what you want to see! What else do you want us to track? How would you like us to visualise them? One thing we really want to add is a feature for you to download your statistics. They are yours after all, and you should be able to do with them what you want. We also want to make the ‘context’ visualisations fully interactive as discovery modules, just like on the rest of the platform.